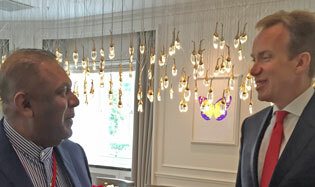 Sri Lankan’s foreign minister visits Norway to revive ties – full detail..
20.06.2016 – 12.20 PM from Dubai to Oslo, Sri Lankan foreign Minister dedications was received by Mr. Thorborn Gaustadsater ambassador to Norway in Sri Lanka, H. E. M. jayantha Palpane, Ambassador of Sri Lanka to Norway and Mrs. T. P. Dharmasena from the Embassy of Srilanka together with Ms. Maren Kyvi from protocol MFA. 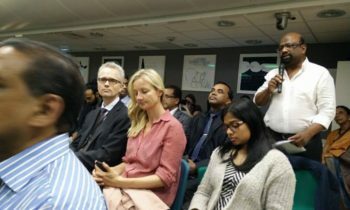 During the visit, the Foreign Minister participated in a business seminar at ‘Innovation Norway’ in Oslo, attended by the Norwegian business community and potential investors with the objective of encouraging Norwegian businesses to invest in Sri Lanka. 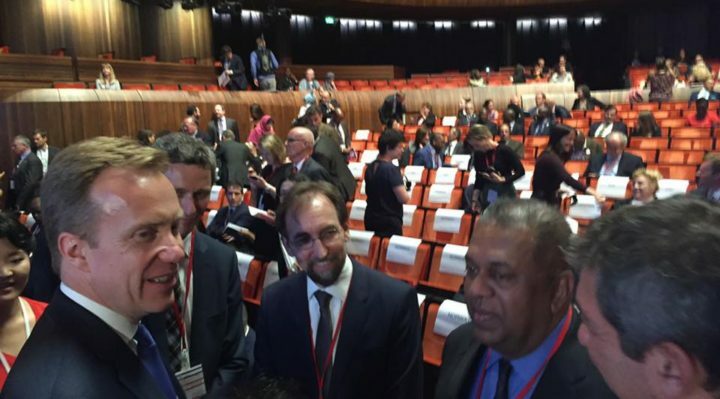 Sri Lankan Foreign Minister Mangala Samaraweera has said that the nature and structure of the Judicial Mechanism meant to try cases of war crimes will be decided only after consultations with the Tamil National Alliance (TNA) and the organizations representing the victims. 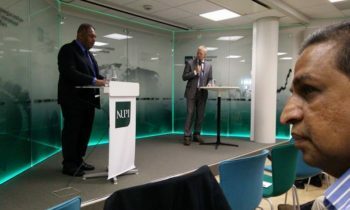 Speaking at the Norwegian Institute of International Affairs in Oslo, Samaraweera said: “There is a certain degree of controversy on how it should be set up and the level of international participation. 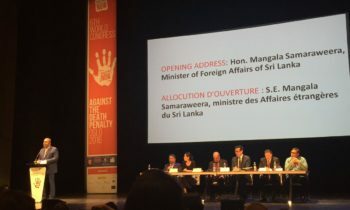 Full text of Minister Samaraweera’s Speech at NUPI..
Mangala Samaraweera, Minister of Foreign Affairs of Sri Lanka in Norway to attend the 6th World Congress against the Death Penalty. He represents a government that, after entering power in 2015, have taken a new and constructive approach towards the country’s minorities. Sri Lanka is currently making large efforts to reconcile Sinhaleses, Tamils and muslims in the aftermath of the civil war, which came to an end in 2009. This work is anchored in the UN’s efforts for human rights. 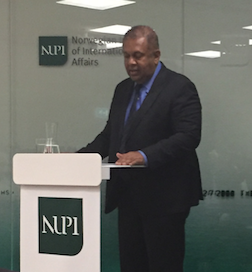 As part of his visit, Foreign Minister Samaraweera has given a talk on this important work. I’ll just like to say a few words before we start as you know Sri Lanka has a very important place in Norwegian history and consciousness. Norwegians feel very close to Sri Lanka even though it’s very far away. It’s my pleasure to welcome the foreign minister of Sri Lanka the honorable Mr. Mongorat Sadabaya. The government after entering power in 2015 have taken a new constrictive approach to towards the country’s minorities. Sri Lanka is make very large efforts to unite the Sinhalese the Tamils and the Muslims in the aftermath of the civil war ended in 2009. And also this work in active in human rights and in the context of the conference on work against the death penalty that’s going on in Oslo this week. It’s therefore very good to have the foreign minister Sadabaya who has been a member of parliament since 1989 so it is quite a bit of experience so talk on this subject. So I would like to welcome you. Thank you, thank you, Ladies and gentlemen and friends. It is indeed a great honor to be here today at the Norwegian Institute for International affairs. And I would like to thank the management especially Mr. Wilsheim for giving me the opportunity to talk about recent developments in Sri Lanka. Ladies and Gentlemen, in fact all of you are aware, that on the 08th of January last year in a historic election, in fact what the world calls the rainbow election of 2015, the people of Sri Lanka voted for change, and for democracy, reconciliation and development, the three pillars on which the Government of President Maithripala Sirisena and Ranil Wickremesinghe are taking the country forward today. In fact on that day, the people of Sri Lanka chose free and fair elections, good governance and the rule of law over authoritarianism and impunity; they chose stability, reconciliation and peace over the politics of fear and hate which had prevailed for many, many years previously. And they eschewed isolationist crony capitalism for openness to the world and a competitive, transparent rules-based economy. In fact, this victory in January was repeated again in August where extremist political parties on all sides of the divide were again decisively defeated and for the first time in Sri Lanka’s history, the two principle political parties which have governed Sri Lanka since independence chose to be on the same side leaving aside the bitterness of the past. 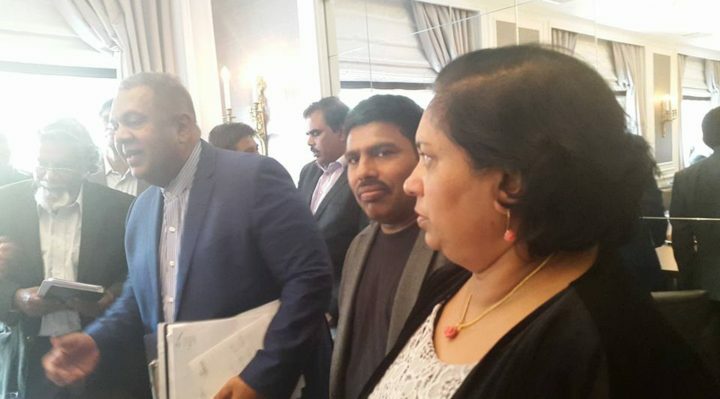 And also for the first time, the leader of the TNA, the party which represents the Tamil community in Sri Lanka was chosen as the leader of the opposition and thus I feel a new window of opportunity was opened for Sri Lanka after many years to rectify the mistakes of the past and go forward towards a new future. In fact as you all may be aware, when Sri Lanka gained independence in 1948; it was a country which the world believed will succeed in no time. I have seen an article written in the, I believe it was the London Times, the day after Sri Lanka gained independence from the British. The editorial in that paper says Ceylon, as it was called then, which gained independence will in no time become the Switzerland of the East because of its strategic location, because of its human and natural resources. Not only that, as recently as 1965, Lee Kuan Yew, the new Prime Minister of Singapore then having just broken away from the Malay Union presenting his first budget says that my ambition in 65 of course is to surpass the growth rate of Ceylon in the first five years meaning that we were way ahead of even Singapore at that time. But of course by 1983, Mr. Lee Kuan Yew went on to say that Sri Lanka is an example that no country should follow because we had all the opportunities, we had all the reasons to succeed but because we could not come to terms with our own diversity as a nation, what could have been easily solved at the early stages then became in to a bitter war and as a result, Sri Lanka again today has to I believe start, recommence that journey all over again, trying to catch up for lost opportunity. Because as I said, the new conjunctions have given Sri Lanka an opportunity it has never had for a long time. We have a Government which consists of the two principle parties. We have an opposition and a leader of opposition who represents the moderate aspirations of the Tamil people and other minorities of Sri Lanka and therefore we also have a Government which is indeed committed to the three pillars of governance as I mentioned earlier, that of democratization, of reconciliation and development. In fact again as some of you may know, we have achieved a considerable amount, many victories, in a short period of time in the area of democratization. Within the first 100 days itself, President Sirisena pruned down many of his executive powers as much as he could without going through a referendum as the Supreme Court requested. He reintroduced term limits for the Presidency. He again took away all the institutions like the Judiciary and the Public Service Commissions, the Corruption Commissions all out of the grip of Presidential rule and independent commissions are now functioning again and also committed himself to a new Constitution, not merely Constitutional Amendments, a new Constitution. Once a new Government was formed after the General elections, which as I said took place last August and in Jan 09th of this year when the President was celebrating his first year in office, we converted the Sri Lankan Parliament to a Constituent Assembly tasked with the objectives of drafting a brand new Constitution for Sri Lanka. That was because we felt that the two Constitutions which were in place since independence, the two Republican Constitutions of 1972 and 1978 did not take into account the diversity of Sri Lanka as a nation. As you know, Sri Lanka is a multi ethnic, multi religious, multi lingual, multi cultural nation. The Sinhalese and the Tamils have lived in Sri Lanka since history was written. The Muslim community came as traders and then lived there and had contributed immensely to the history of our country for the last 1000 odd years and we have other communities like the Burghers, the descendents of the Dutch and the Portuguese. We have the Malays and we even have indigenous Sri Lankans, the Veddas but unfortunately because the two earlier Constitutions were basically majoritarian in nature, we feel that paved the way for one of the most bitter civil wars Sri Lanka and the world in fact has ever seen and our Government, the non – recurrence being one of our primary objectives, first and foremost we must now create a Constitution which will celebrate the diversity of Sri Lanka and that is what we are doing now. In fact the first report of the consultations with the public was tabled last week in parliament. The work of the draft is going on very seriously and fairly quickly in parliament, in the Constituent Assembly. In fact we have told the people who are doing it that we would like to have the first white paper on the Constitution distributed sometime in September and hopefully before the budget of Sri Lanka which is usually presented in the late November. We are hoping to present, the new Constitution to parliament for ratification by a two thirds majority, which most probably will have to be again followed in the New Year by a referendum. But of course with both the principle parties working together on this, we are confident of the two thirds majority as well as “Yes” at a referendum in the future. Along with the new Constitution, we have also being bringing various new laws to strengthen the democratic framework. As I said the 19th Amendment which again freed all the legal mechanisms and the media, the Public Service Commission, and free media from interference from the government. In fact I won’t be there for the vote but tomorrow even the Right to Information bill, which has been something which Sri Lanka has been wanting for long time, will be presented in Parliament and passed. And of course the other area in which we have been concentrating is the area of reconciliation, because without reconciliation as I mentioned Sri Lanka cannot achieve the promise it has. So that is why the new government was elected on a very strong mandate for reconciliation and a mandate also gave us power to start a domestic mechanism to inquire into the various allegations of human rights violations, perhaps even war violations during the earlier period. In fact, that is why Sri Lanka took the very bold step of co-sponsoring the resolution presented in Geneva by the United States initially. After discussions, we decided that co-sponsoring is the best way we can bring justice to those who need it in Sri Lanka. In fact, some people like to say that, specially the extreme nationalist wings which are still very much alive and kicking in Sri Lanka, with hand in glove with one or two ghosts from the past. They like to say that we did it under International pressure. I like to say to you ladies and gentlemen, No! it was not the resolution, the decision to co-sponsor the resolution and to commit ourselves to a reconciliation process. 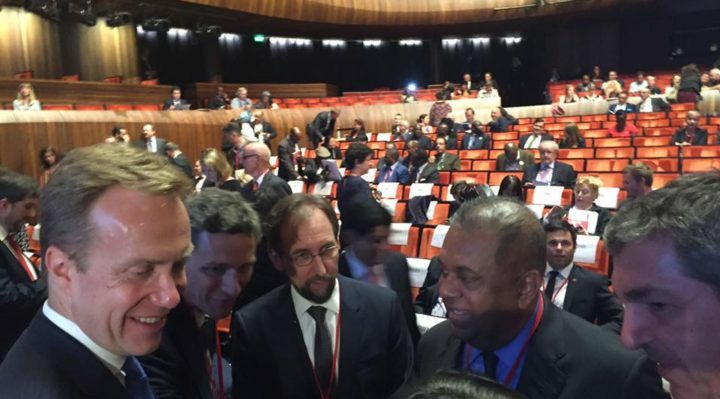 A process which will basically take into account (that) our past was taken not because of the international community but we as a Government feel that it is the only way Sri Lanka can move forward. The only way that is come into terms with our past so that we can move forward as a united nation. So in order to do so, we talked about 4 possible mechanisms. The mechanism to seek the truth, the truth seeking mechanisms. And the second one was a mechanism for accountability, for justice. The third one was of course reparation and the fourth one is to ensure non-recurrence, to ensure that some of the tragedies which took place in our beautiful little island in the last so many years since independence do not ever, ever happen again. So with that in mind, we have been working hard in the last several months, especially since the resolution was passed unanimously on the first of October last year. We have now in fact, the first of these mechanisms which we proposed, the Permanent Office for Missing Persons has now being finalized and also got unanimous approval by the Cabinet and the next step of publishing it as a government gazette was also completed two weeks ago in all three languages and the final step would be to present it in Parliament within the next month or so once the due time frames are completed. So the OMP or the Office for Missing Persons, I feel is a huge, massive step forward. Then of course, we have also created what is called the SCRM, Secretariat for Coordinating Reconciliation Mechanisms and that is working with leading members of the civil society, conducting consultations on the other mechanisms now. Consultations with all the stakeholders, the victims of the war, members of the armed forces, wives of the missing and the different political parties etc. That process has already started. Meanwhile we have been working with the government of South Africa about their experiences in setting up a Truth and Reconciliation Commission. Of course we aren’t guided by the South African model of the TRC because we feel that a model based on confession and forgiveness which I believe, if I am to simplify the South African process which is not as simple, but is not what Sri Lankans want. Many of them want justice. So we are working out the contours of not only the TRC but as I said what should come afterwards is the setting up of the special courts. Of course there’s a certain degree of controversy on how it should be setup and the level of international participation. That too will be decided after the consultations are over but all I can say now is whatever we decide upon, will and must have the approval, not only ourselves but of the victims those who suffered. This is not an exercise to please ourselves. So the final contours of the architecture of the courts we are hoping to set up will be in discussion. Especially with parties like the TNA and other groups which represent the victims. Along with that we have also taken certain steps to further kick start the process. As I said earlier, with the intention of de militarizing the North and the East immediately after coming into power, we appointed civilians, two highly respected civil servants as the Governors of the North. The demilitarizing process has started but of course not complete but we are now in the process of even giving back the land which has been taken over for military purposes over the years. In fact I know that during the course of this week another 700 acres will also be released. So far nearly 4000 acres but perhaps an equal amount of land remains to be released and that too we have told the military, that all must be released in a timeline going up to the end of 2018. Of course we did ratify the convention of enforced and involuntary disappearances for the first time and the enabling legislation will be presented to Cabinet, which is done by my Ministry, the moment I am back in Sri Lanka in July. Hopefully that will certainly confine the white van culture of terror we had earlier to the pages of history. And we have. In fact, again I don’t want it (to be) like the monkey praising his own tail, (to) go on about the achievements we have made but in the short period of time, we have made some remarkable achievements and we are continuing to do so. But I saw some of our friends in the international arena call what we have done in this time as ‘baby steps’ but to them I’d like to say that even though it may look like baby steps to some of you in the international community, I think if I may paraphrase Armstrong going to the moon, It’s a giant leap for Sri Lanka and we will move forward. From here I go to Geneva next week where I will be making a statement on what we are doing now and also the fact that the Government is united in its determination to come to terms with what happened earlier. Again certain newspapers and social media like to say that the President has one view, the Prime Minister has another, the Foreign Minister yet another but it is not so. We are working unitedly. In fact, those of you who heard President Sirisena addressing the nation on the 4th of February during the independence day of Sri Lanka this year, he said “ It is now time for us to seize the current opportunity that is before us to implement the provisions of the Geneva resolution, not because of International pressure, but because as a nation, we must implement these provisions for the sake of restoring the dignity of our nation, our people and our military, in order for Sri Lanka to regain her due position as a strong democracy among the community of nations.” So we are moving ahead as I said with confidence and meeting the challenges head on. But of course if democracy and reconciliation is to succeed, we feel that the third part of our pillar, which we are moving the country the pillar of development, must also succeed. The people of Sri Lanka must now feel that their pockets are fuller, that they are better off economically, their standards of living has risen because of our open policy to the world and our policy of coming to terms with our past. That is why I am here and this morning I had the opportunity, (which) the ambassador arranged, a meeting where we addressed many investors who are willing to come to Sri Lanka. Sri Lanka is a middle income country. We are no longer eligible for handouts or aid or grants. We must look after ourselves and in order to do so Foreign Direct Investment is of paramount importance in order to kick start the economy. Sri Lanka I would say has huge potential. In fact, Sri Lanka has been known as a paradise for tourists for a long, long time but now we also want to make Sri Lanka also a paradise for foreign investors. In fact we feel that it is strategically placed today. As the East or Asia grows in importance, we could be a strategic gateway to the Indian Ocean and to the Indian subcontinent. We have, even though our own market is relatively small. 21 million is our population, but we have Free Trade Agreements with both India and Pakistan. We are now in the process of negotiating a Free Trade Agreement with China and Japan which I’m sure as I said earlier makes it an exciting gateway for investors from this part of the world to come there. We have been getting a lot of support from the West since the new government came into power. There’s a tsunami of goodwill I’d like say but that good will must now transform itself into practical day to day realities and the best way you can help as I said is by choosing Sri Lanka as your destination of choice for investment for trade. We have ended the previous government’s policy of self isolation and confrontation. Today we have embraced the world. We were totally dependent on China and China along for nearly 10 years but I’m happy to say that we have restored our relations with our neighbor and friend, India to a level of excellence after many years. 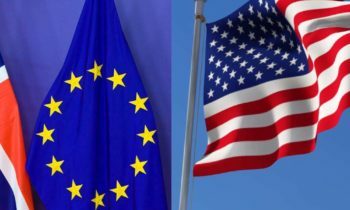 We have restored our ties with the European Union. In fact just last week the fishing ban imposed on Sri Lanka was restored unanimously in the European Parliament and yesterday we handed in our official application to have the GSP + concession restored. Earlier it was again taken away because we did not or we had violated many of the criteria, which was required to get it initially but now are ready to get it back again and offer and restore the thousands and thousands of jobs lost as a result of that. With the United States, we have raised our relations to a level we have never seen before and from this year we started the US – Sri Lanka partnership dialogue in Washington in February with Secretary John Kerry. With Japan, President Sirisena was the first leader to be invited to the Outreach Summit ever in its history and all the G7 countries have promised to help us. If you want to know what kind of diplomacy Sri Lanka is following, I would like to go back to something Jawaharlal Nehru said in 1947. He said “Whatever policy you may lay down, the art of conducting foreign affairs of a country lies finding out what is most advantageous to the country.” So I think today it may sound very selfish but we aren’t ideologically driven but self interest is I would say is the driving force in our foreign policy. Because we want to ensure that the people of Sri Lanka, even at this late stage, get the future that they truly deserve. Finally thank you again, thank you very much for giving me this opportunity to go through some of the developments and I would like to invite all of you, (as) today there are no restrictions in visiting any part of the country. All the Norwegian people here, I’m sure many of you have come here because you have an interest in the country and you should come back and see for yourselves. Of course for the Sri Lankans who are here, the Sri Lanka Diaspora who are here also, we would like to invite you to please come back and see for yourself and become partners in the forward march of your country. 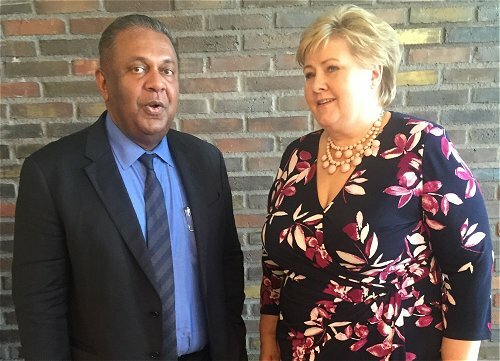 Sri Lanka’s Foreign Affairs Minister Mangala Samaraweera paid a courtesy call on Prime Minister of Norway Erna Solberg on Tuesday, (21 June), the Sri Lankan Foreign Affairs Ministry said. Norwegian Prime Minister Erna Solberg welcomed the progress in Sri Lanka in reconciliation, strengthening democracy, good governance and economic development policy, a media release issued by the Foreign Affairs Ministry said Thursday. Prime Minister Solberg expressing her views during the meeting with Minister Samaraweera acknowledged the valuable contribution to Norway by the Sri Lankan community in the country and commended the Sri Lankan government’s efforts made to actively engage the Sri Lankan diaspora including in Norway in development efforts. 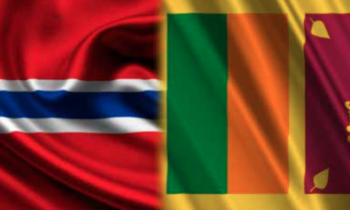 The Foreign Minister will hold bilateral talks with his counterpart, Foreign Minister Børge Brende today. 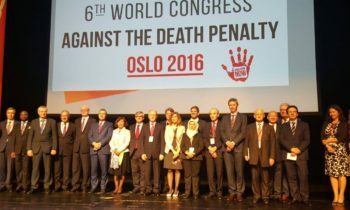 He will also deliver the opening address at the first plenary session of Sixth World Congress Against the Death Penalty on “Progress and set-backs in Asia: lessons to be learnt”. This year’s Congress will focus on National institutions for human rights, and Progress and setbacks in Asia. The Congress will attract 1300 participants from over 80 countries, including Mr.Tore Hattrem, State Secretary at the Norwegian Ministry of Foreign Affairs , U.N. High Commissioner for Human Rights Zeid Ra’ad Al Hussein , Norwegian Minister of Foreign Affairs, Mr Børge Brende , Sri Lankan Minister of Foreign Affairs, Mangala Samaraweera , Hon.Wijedasa Rajapaksha, Sri Lankan Minister of Justice and Labour Relations , ministers around the world, parliamentarians, academics, lawyers, and members of civil society. 14.30 PM – Guided tour at Munch Museum. 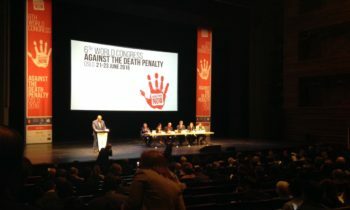 17.00 PM – Opening of the 6th World Congress Against the Death Penalty. 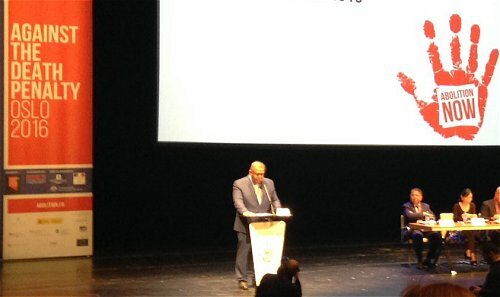 Opening speech by Mangala Samaraweera, Minister of Foreign Affairs of Sri Lanka in Norway at the 6th World Congress against the Death Penalty. 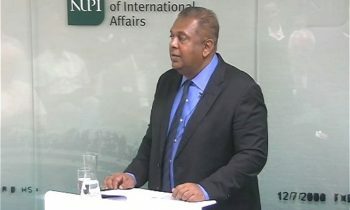 Full text of Minister Samaraweera’s Speech.. Despite its widespread use, for millennia the death penalty has caused lingering societal discomfort and unease. Fairly early on in history many enlightened leaders have found the death penalty degrading of human dignity. For example, in ancient Sri Lanka a number of kings – influenced by the Buddha’s teaching – abolished the death penalty. In fact, for much of the first, third, fourth and thirteenth centuries the death penalty was not employed in Sri Lanka. This may help explain why for nearly a century there has been a consensus among the legislative leadership of my country that the death penalty ought to be abolished. This consensus was based both on moral grounds and on the ineffectiveness of the death penalty as a deterrent. As far back as 1928 the Ceylon Legislative Assembly voted 19 to seven in favour of a resolution on abolishing the death penalty, which was moved by D.S. Senanayake, who became the first Prime Minister of Ceylon and founder of the United National Party – one of Sri Lanka’s two main political parties. In the end, abolition was only thwarted by the high-handedness of the colonial authorities of the time. In 1956, a few years after Independence, my father, then the Parliamentary Secretary for Justice, proposed a bill ending capital punishment which was supported by S.W.R.D. Bandaranaike, the Prime Minister and founder of the Sri Lanka Freedom Party – our island’s other main political party. The bill passed but tragically the death penalty was resumed a few years later as result of Mr. Bandaranaike’s assassination until a de facto moratorium was instituted in 1976. Allow me to conclude by saying that abolishing the death penalty requires persuasion and resolve but above all it requires leadership – the collective leadership of legislators, activists, editors, academics and jurors. As momentum towards critical mass develops, I am confident that the coming years will see the death of the death penalty in our region. 11.00 AM – Departure from TBD for the (Storting ) Norwegian Parliament. 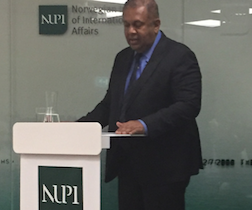 Minister Samaraweera welcomed with appreciation the offer by Norway to provide assistance on fish stock assessment and conduct an oceanographic survey in collaboration with National Aquatic Resources Research and Development Agency (NARA). A request was also made from Norway for assistance in developing a National Policy framework for the Fisheries sector. At the meeting with the Standing Committee on Foreign Affairs and Defense chaired by Anniken Huitfeldt of the Labor Party, responding to questions raised, Minister Samaraweera briefed the Members of the Committee on the progress and achievements of the Government as well as plans on Constitutional reform, reconciliation and development. The Minister also briefed the Members of the Standing Committee on Foreign Affairs and Defence on the progress and achievements of the Government as well as plans on Constitutional reform, reconciliation and development. Emphasising the need for greater interaction and engagement between the legislatures of the two countries, the Minister invited the Members of the Standing Committee to visit Sri Lanka at a mutually convenient time. 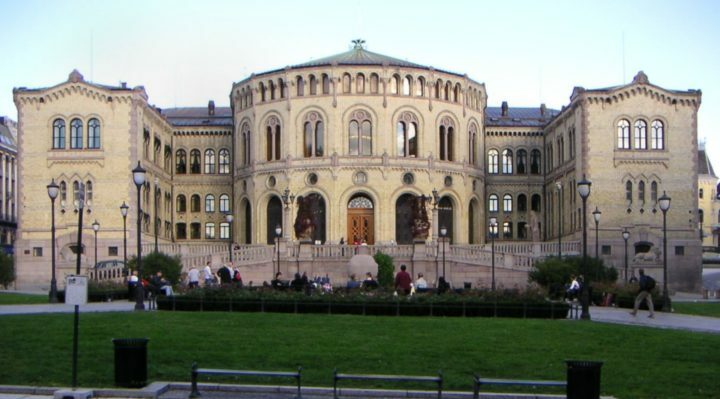 12.45 PM – Meeting with the Standing Committee on Foreign Affairs and Defence at Norwegian Parliament. 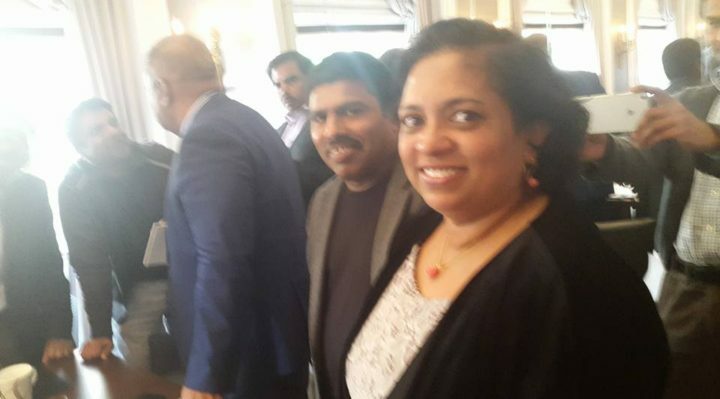 3.00 PM – Meeting with the so call “diaspora Venu at Hotel Continental the meeting is not open to the media and real Sri Lankan Diaspora. The meeting with Foreign Minister Samaraweera is for “invited only for loyal to former President Mahinda Rjapaksa” as is a closed meeting. 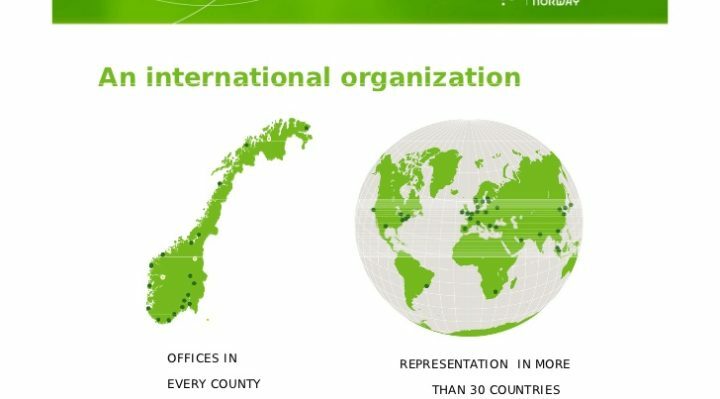 Around 14 000 Sri Lankans lives in Norway also 45 big diaspora Orgs working on Sri Lanka but none of them are invited including TNA or UNP supporters. 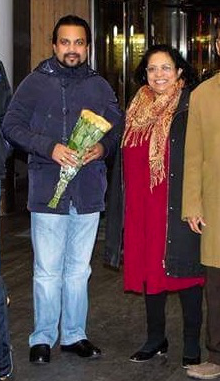 Embassy of Sri Lanka in Oslo arranged meeting with one Bus driver, one Tamil restaurant cook, two Tamil toilet cleaner, one Ticket Seller, Muslim Criminal street gang members, JVP Members and LTTE’s KP Group, POLTE linked Prof, as a closed meeting. 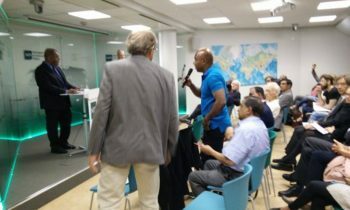 Embassy of Sri Lanka in Oslo, Systematically prevented real Sri Lankan TNA, UNP, Upcountry Tamils, Second- and third-generation immigrants diaspora meeting with Foreign Minister to block his expanding political network with Norway. 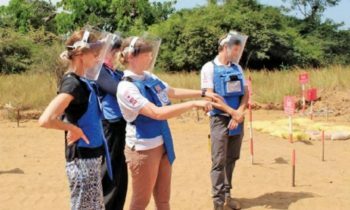 Norway supports IDPs in Sri Lanka – At a special meeting with Sri Lankan Foreign Minister Mangala Samaraweera, Foreign Minister Brende said that Norway gives eight million kroner to IDPs in the Jaffna Peninsula and the eastern province of Sri Lanka. 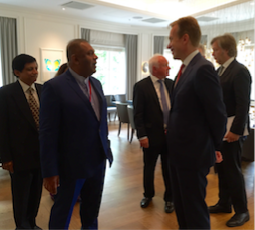 – The Government of Sri Lanka has taken several important steps in efforts to promote reconciliation. In the meeting we discussed, including how Norway can assist with reconstruction in the Tamil areas in the north and east and the way forward for business cooperation between Norway and Sri Lanka, says Brende. 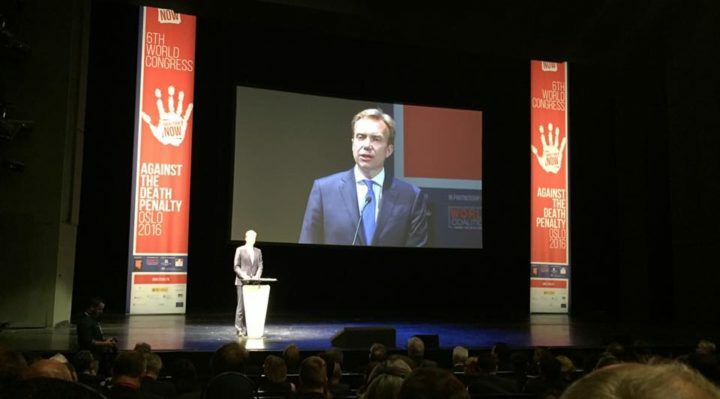 I’m glad for the positive signals related to the abolition of the death penalty as Foreign Minister Samaraweera has made here in Oslo, and I hope that they will use the constitutional process to formally abolish the death penalty, says Brende. 11.00 AM – Meeting with DNV GL, Loyd. 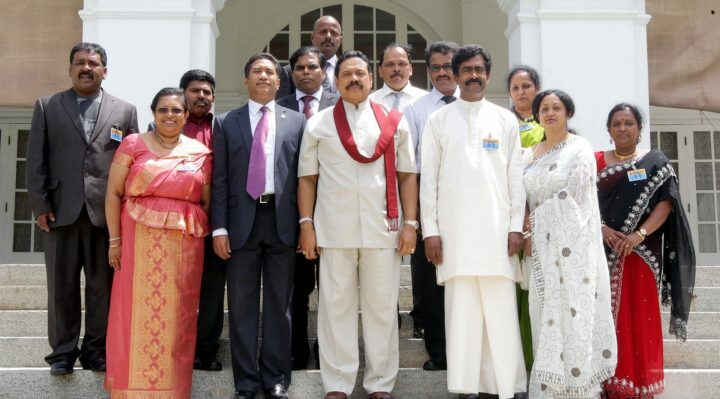 Embassy official appointed by old government and all of them are Mahinda and Gothabaya friends.